The news has been around and we have also covered it on Techduology. Apparently, there has been leaked images and news about Nokia’s secret Android phone (despite the fact that they have been bought over by Microsoft). 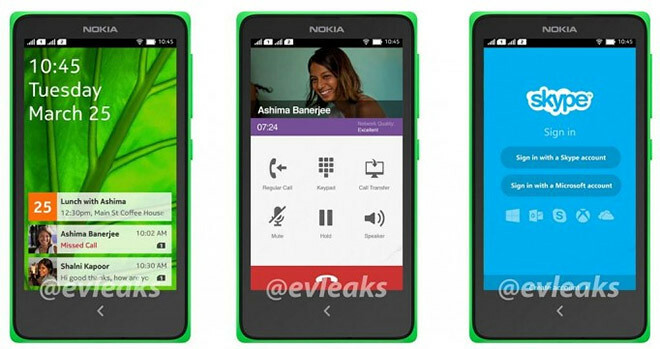 So the Nokia Android device is codenamed ‘Normandy’ and the interface has been leaked by the famous @evleaks yesterday. From the visual above, we get to see 3 of the interface which have been skinned by Nokia itself, very much like how Samsung wraps Android with their ‘touch wiz’ interface. What we know until now is that this device is of the same range as the Asha series and has design elements from the Lumia series. The device also supports dual sim. Do you think Nokia will eventually release this? What do you think of the interface? Leave a comment and let us know.